Petro Poroshenko will have to play a delicate balancing act to please both the stubborn Russian-speaking conservatives and the fiery Ukrainian nationalists. The standing ovations Ukrainian president Petro Poroshenko won in Canada and the U.S. stirred an array of emotions in Moscow. What is there to applaud in the president’s performance and in today’s Ukraine? According to the UN, at least 3,000 people, mostly civilians and Ukrainian citizens, have been killed in the fighting in the south-eastern region of Ukraine known as Donbass; the truce established in September is routinely breached, with more killed every day – a situation Ukraine has not witnessed since the Second World War. Even if Poroshenko is right about being a victim of an “intervention by a foreign power”, most fighting is done by local people and most of the victims are citizens of Ukraine. A situation which deserves pity and compassion, not applause. But this has not yet disqualified Mr. Poroshenko as a potential peacemaker. Russian president Vladimir Putin never reciprocated the Ukrainian president’s accusations of “barbarity” made in his speech in the U.S. Congress, instead saying Poroshenko could be a partner for Russia. Even pro-Russian guerrillas from the embattled cities of Donetsk and Lugansk say there are viable points in the law on special status for Donbass, recently pushed through the Ukrainian parliament, the Rada, by Poroshenko. But analysts in Russia and Ukraine warn Poroshenko against being lulled into passivity by his fans in North America. 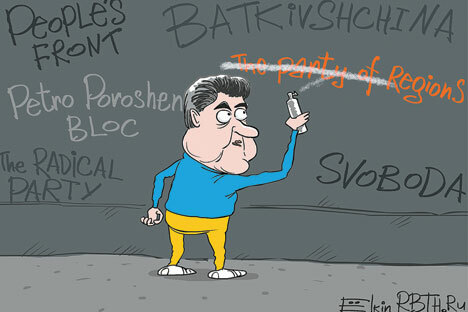 Pessimists say the “united Ukraine” Poroshenko says he is defending in Donbass no longer exists. The Party of Regions (PR), once the power base of ousted former president Viktor Yanukovych, is sending mixed signals about its stance on the Rada elections: the party is expected to run in individual constituencies, but not on a party list. But even if it participates, its leader Mikhail Chechetov had a point when he said Kiev should end the war before having elections. The power base of the PR was traditionally in the east, primarily Donbass. So one can understand why the party does not want to run, since its voters in the east have no chance to vote. Authorities in the self-proclaimed new state of Novorossia, whose control is limited to part of Donbass, say they will have nothing to do with the regime in Kiev and won’t have Kiev-organised elections on their territory. Supporters of European integration for Ukraine failed to take into account the east-west chasm, which had been a problem for centuries. In fact, the divisions are natural, as the west had been until 1939 part of the Austro-Hungarian empire, while the east had been part of Russia for three-and-a-half centuries until the collapse of the Soviet Union in 1991. After the takeover in Kiev by Maidan activists in February 2014, the Party of Regions lost support: when its office was set on fire in Kiev by Maidan activists, people realised the political situation had changed and the party would no longer be calling the shots. The party fell from 36pc to less than 5pc in the polls. But it looks like the “regionals” will not be permitted even a purely symbolic political presence. President Poroshenko, who was one of the founders of the Party of Regions, probably understands that not having this party on the ballot list is a defeat for him. He might need the “regionals” now most of all, as radical Ukrainian nationalists accuse Poroshenko of “selling off the motherland to Russia” by signing the law on special status for Donbass. “Terrorists” is what the Ukrainian authorities call insurgents in the east and, of course, these people were not particularly happy to read Tyahnybok’s comments. It does not bode well for their future in “united Ukraine”, with promises of amnesty from Poroshenko not supported by several powerful nationalist groups in the Rada. Poroshenko will have to navigate his way between the stubborn Russian-speaking conservatives and the fiery Ukrainian nationalists. Both are ready to restart the war. This will be a hard task. Much harder than winning applause in the U.S. Congress. After all, the last Soviet president Mikhail Gorbachev won even more applause there in 1990-91 – months before losing power along with the “united” Soviet Union. Dmitry Babich is a political analyst working at the Voice of Russia radio station.